If Halloween is gay Christmas, Christmas is gay Halloween: a fun excuse for parties. And there are plenty of delightful queer holiday specials, from Christmas at Pee Wee’s Playhouse to Meet Me in St. Louis to The Family Stone. But one of the best, weirdest, smartest and messiest of them all is Batman Returns. 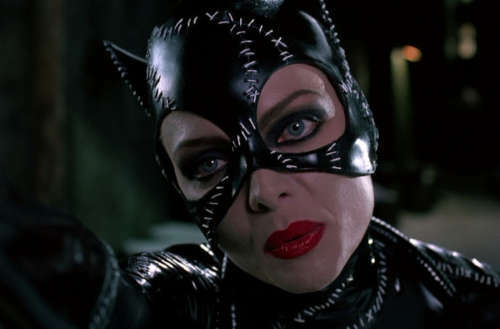 One of the best things about Batman Returns is that it’s not really about Batman at all — he’s just a prop for Michelle Pfeiffer’s Catwoman, the character who experiences the true arc of the film. But Pfeiffer almost never got to play the role; her rivals for the part included Demi Moore, Annette Bening, Nicole Kidman and even Cher. Susan Sarandon had a shot at it as well, until she decided to do Lorenzo’s Oil (a movie that, coincidentally, Pfeiffer had left). Sean Young also wanted the part and went so far as to show up at the production offices in a Catwoman costume that she’d made herself. It didn’t go over well. The Catwoman costume was so iconic that some cities had to assign cops to guard the bus stops where the movie poster hung, because they were so prone to being stolen. In all, there were sixty costumes made for Pfeiffer — each costing a thousand dollars — and they were so tight she became light-headed during filming. Keaton, as Batman, experienced some pain as well. His costume weighed 55 pounds and was difficult to move in. But the costumers did make one concession to ease his burden: He asked for, and received, a zipper in the pants. Director Tim Burton leaned heavily on animal alter-egos to characterize the film’s main figures. There were CGI bats for Bruce Wayne, furry felines for Selina Kyle and an army of penguins for Oswald Cobblepot. Obtaining the penguins presented a challenge. They had to be flown over from England in a refrigerated plane, and were presented with daily fish deliveries during filming. The set was kept at just above freezing temperatures, and the birds seemed contented enough. Most mated and produced eggs afterwards, and one was found sleeping with one of the mechanical penguins. It’s not difficult to peel back a few layers and find a queer meaning to the film. It’s the story of a woman seeking revenge on a world that insisted she conform to shallow gender stereotypes. Selina Kyle bought into traditional feminine ideals her whole life, and it was only after a ruthless man tried to kill her that she has an epiphany about embracing her sexual expression in a scene where she literally demolishes a closet. The Penguin reflects another tragic approach to queerness: a desperate bid for parental approval. His sad quest to be loved and his fury at those who rejected him are ultimately his undoing. On the other hand, Catwoman successfully realizes that it’s ultimately Max Schreck’s capitalist exploitation that must be destroyed, and Bruce Wayne’s web of lies that must be resisted. So this holiday season, cozy up with a loved one and enjoy Batman Returns. Reject the closet, embrace your sexuality and, above all, destroy capitalism. Happy Holidays to all!